My weekly column for Taste T.O. this past Tuesday was a re-review of Great Lakes Devil’s Pale Ale – “re-review” because I had previously written about it three years ago when it was first launched in cans, but the recipe has recently been tweaked to make it hoppier and much more enjoyable. Speaking of re-reviews – last night I cracked open one of those lovely 750 ml ceramic swing-top bottles from Beau’s All-Natural Brewing, containing their limited edition Screaming Beaver Oak-Aged Angry IPA, which I had been sitting on since May. I tried a pint of it on cask back in the spring and didn’t care for it at all – it was boozy and sticky and just a big hot mess. But either the three months or so of sitting in my fridge took the edge off the bottled version, or it was a beer better suited for bottle format over cask – either way, I enjoyed the hell out of it this time. Big aroma with the oak, malt and hops playing very nicely off each other, and a flavour that starts sweet, with some notes of caramel and tropical fruit, before it turns dry and bitter with a wonderfully long and lingering finish of pine and grapefruit and wood. Mmmm-mmmm! Not sure how I missed mentioning this before, but a few weeks back, my buddy Troy over at the Great Canadian Beer Blog did a Q&A with me as part of a series of Ontario beer blogger profiles. Seven of us have been featured so far, and as the blogroll I maintain over at Canadian Beer News shows, Troy will have plenty more to choose from if he decides to continue, especially if he expands to cover all of Canada. Hard to believe that just a few years ago, there were only 3 or 4 of us doing the beer blogging thing in the whole country. Tagged IPA, Ontario, Taste T.O. 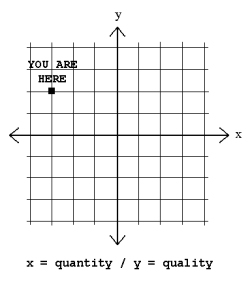 While attempting to catch up on my reading of other beer blogs this evening, I got to thinking about the old “quality vs. quantity” equation. It applies to more than just beer blogs, of course – to more than just blogs in general, even – but I found it interesting to analyze things just in terms of those of us who fill our little corners of the Internet with ramblings about beer and brewing. While I won’t mention any names in order to avoid unnecessarily offending or ego-boosting, I was especially struck by the vast variation on both sides of the equation amongst our clan. 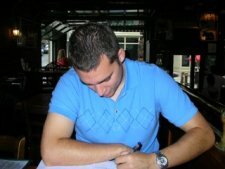 There are highly skilled writers who post very infrequently; remarkably prolific bloggers who can barely string a sentence together; those who manage to write both often and well; those who offer their clunky and turgid content on a mercifully infrequent schedule; and any and every combination in between. As for this blog, it’s pretty obvious where it fits on the quantity scale (i.e. pretty freakin’ low), and as the sloppy image to the right indicates, I have enough confidence in my writing ability to think (or at least hope) that it sits somewhat higher on the quality axis. I often wish that I could even things out with some more frequent content, and I always have at least a half-dozen ideas that I’d like to write about. But as long as this poor little blog continues to play fourth or fifth fiddle to my writing for other places, not to mention my job and other real life stuff, posts here will likely always come in fits and starts. I can only hope that the quality is high enough to keep people coming back for my less-frequent-than-I’d-like-them-to-be musings. 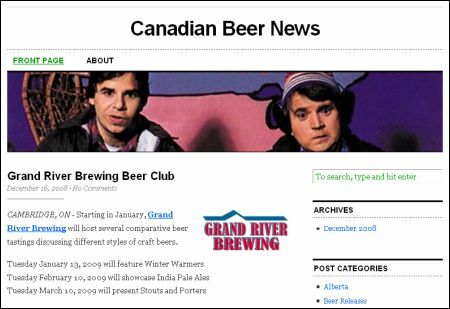 I’m pleased to announce the launch of Canadian Beer News, a new blog from yours truly that will focus exclusively on news from the Canadian brewing industry. There will be no beer reviews or opinion pieces, simply press releases and news bulletins with announcements of new beer releases, brewery openings and closures, news about festivals and events, and other information from breweries all across the country. Giving credit where credit is due, I must admit that the idea was ripped off of – uh, I mean, “strongly influenced by” – beernews.org, the excellent and informative blog/website that provides similar information on the American craft brewing scene. Since there was nothing similar here in Canada (or at least no blog dedicated exclusively to new beer announcements and other news), and I was already getting a lot of press releases and announcements sent to me from various breweries, I figured I might as well set up a place to cut & paste the info for all to see. Please pop over for a look, and let me know what you think. And if you’re a brewer in Canada, please add me to your mailing list so I can spread the word on what you’ve got going on. One of the results of my unintended hiatus from blogging during August through October was that my inbox filled up with assorted blurbs and announcements that I might’ve posted about, had I had the time. I expect that most of you will have already heard about this, as it’s been all over the beer blogs and magazines for months now, but in case you’ve somehow missed it: One of North America’s top drink writers, Rick Lyke, was successfully treated for prostate cancer early this year. Following his recovery, he launched Pints For Prostates, a campaign to raise awareness of PSA testing, one of the best ways for prostate cancer to be detected before it’s too late. Since my day job is with Cancer Care Ontario, I know how many men are affected by prostate cancer, and important it is to get tested, so I’m more than happy to support the cause. Joe Redner at Cigar City Brewing, a soon-to-open microbrewery down in Tampa, emailed a while back to let me about their blog where they’ve been documenting the entire process of getting the brewery together. I finally spent some time poking through the blog this weekend, and it’s a pretty fascinating journey they’ve been on. Hope I’ll be able to get my hands on some of their brews when they open (which should be before the end of the year by the looks of things). 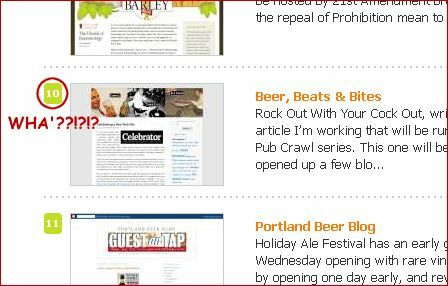 Ed Westin wants me to mention California Beerzine, an online magazine that fittingly covers beers in California. I’m a bit confused by the site, as the top banner says “FIRST ISSUE” even though they launched in July and are supposed to be publishing monthly. It looks like there have been a couple of things posted in the past few months, but perhaps things aren’t going as smoothly as they had hoped? Whatever the case, the content that’s up there worth a peek. They tell me that the kids today are into something called “social networking”. Which I guess explains the existance of sites like Kegerator Social Network (launched in September) and Democracy’s Drink (which recently passed the 500 member mark). Joel Mayer wrote me a nice note saying that he enjoyed BBB, and inviting me to check out his blog, The Alemonger. So I did, and while he posts even less frequently than I do (I didn’t think that was possible! ), what’s there is good stuff. Write more, Joel! I Made The Top Ten! I’ve got no idea how this happened and who decided I deserved it, but I’ve somehow made it into the Top 10 beer blogs on the whole, entire Internet (or at least, out of the 104 that are listed) according to Blogged.com. I’m frankly humbled and confused by this. Humbled, because it puts me into the company of beer writers who are much better and more prolific than I. Confused, because they have me ranked higher than some more worthy bloggers, such as Alan (#13) and Stan (#14) – and hell, Lew doesn’t seem to be listed at all! At least Jay and Stonch came in ahead of me, which is where they belong. A couple of things are happening out in the greater food & drink blogiverse that readers here might be interested in. First, there’s the 4th annual edition of Menu For Hope, a fundraising campaign undertaken by food & drink bloggers around the wold each December. Originally started in 2004 to raise money for victims of the tsunami, it now raises funds for the UN World Food Programme, with this year’s take earmarked for a school lunch program in Lesotho. While I’m not participating in the event via this blog, we’re going to be raffling off a great prize package over at Taste T.O. 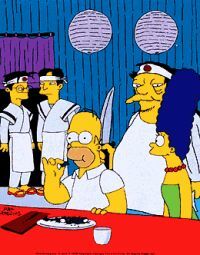 with the theme being a “Culinary Tour of Toronto”. Preliminary details are up now, and the campaign officially kicks off next Monday, December 10th. Under-way now is the nomination period for the 2007 Food Blog Awards, presented by the Well Fed Network. While I harbour no illusions that this blog world have a hope in hell of winning anything – even if I did meet the ‘6 posts per month’ minimum for consideration – there are several other beer blogs that would be well deserving of the award for ‘Best Blog Covering Drinks (Alcoholic and Non-Alcoholic)‘. So if you have a particular favourite, get over there and nominate it. Beer is craft, a mass product. It is not art. And, as a craft in the medium of food to boot, a consumable that depends on its destruction. Second, while I admittedly have a very high level of sensitivity to it, this line of discussion could really be taken to smack of snob (not something I associate with the three gents mentioned so please leave that alone) or at least it is an idea that is paying a visit to the Neighbourhood of Snob and, you know, is finding it somewhat attractive. Fergit it. An absolutely insane number of comments have followed in the 24 hours or so since Alan’s original post, with most of them coming from those who inspired the post in the first place – Messrs. Beaumont, Bryson & Hieronymus – plus a smattering of other bloggers, brewers, and ne’er-do-wells who are all much more eloquent than I. Which is why I’m posting my thoughts here, where a lot less people will see them. Personally, I disagree with much of Alan’s original line of reasoning, at least when it comes to the odd, weird, “extreme”, one-off, limited-bottling beers that are heading into wine-price territory. Such beers are much more labour- and ingredient-intensive than everyday brews, and are generally intended to be a special treat. And they’re most definitely “art”, IMO. As Stephen notes in one of his comments, the relative quality of the cheese he buys – and in turn, the amount he pays for it – varies depending on what he’s going to use it for. Similarly, while I stick with “normal” craft beer at “normal” craft beer prices for everyday drinking, I have no problem splurging more on a bottle of something a little (or a lot) different for a special occasion, or for a tasting with friends, or if I just feel like treating myself. In those cases, I’m willing to pay a premium for the experience. Some time ago, I was lamenting about the fact that the number of Canadian beer bloggers seemed to be disproportionately low in comparison to our American counterparts. There hasn’t been a huge change since then, but I’m happy to report that at least one newcomer has joined our ranks, with more enthusiasm than the rest of us combined. Great Canadian Pubs & Beer was launched by a young fella named Troy Burtch back on August 13th, and in less than 2 months, he’s already made 47 posts on, well, pubs and beers in Canada. It took me something like 7 months to reach that same point. Yikes! I really like what he’s doing with his blog. While it’s fine and good to rate and review beers, and debate the merits of a particular style, and delve into some of the business behind it, and so on and so forth, beer lovers need to remember that beer is a social drink, and where you drink can be just as important as what you drink. A whole bunch of us wrote about this for an instalment of The Session a few months back, but it’s great to see someone writing about beer and pub culture on a regular basis – especially from a Canadian perspective. It’s something that Pint & A Smoke was set to focus on, but that blog is seemingly abandoned now, so I’m glad someone else has taken up the gauntlet. Or the pint glass, rather. Welcome, Troy. Keep it up. By “Green Beer”, I’m referring to beer that is produced and distributed in environmentally friendly ways, which is the focus of Beer Activist, a newish blog that I discovered this week. It’s the online home of Chris O’Brien, author of a book called Fermenting Revolution: How to Drink Beer and Save the World that I got for Christmas but have yet to read. Chris looks like a pretty interesting guy – he has brewed in South Africa, worked with fair trade organisations and co-ops, and is currently part owner of a store specialising in organic brewing supplies and organic/fair trade home coffee roasting supplies. I’m looking forward to reading his blog, and (finally) reading his book as well. Between this, and meeting/chatting with Garrett Oliver the other night, and attending a Slow Food conference earlier in the week, I’m seeing the worlds of local/organic/sustainable food and craft beer becoming more and more entwined. Very exciting stuff! Speaking of Mr. Oliver – my encounter with him was at a fantastic Brooklyn Brewery beer dinner at beerbistro on Tuesday night. I’ll be writing up a full report this weekend, and it will probably be published at Gremolata, assuming Malcolm is interested. If not, I’ll just post it here.